“Live and Let Bee” is a project focusing on the holistic good of the bees, not the humans using the bee products. One of the first indicators of the ecological degradation and problems in nature is their negative effect on bee population. Global climate change, environmental pollution, the decrease in natural lands under human pressure weaken the bees and make them more vulnerable to diseases. And when you also consider the synthetic chemicals used sometimes wrongly and needlessly,by farmers and beekeepers, excessive and unnecessary treatment of the hive/colony, you can understand the severity of the danger the bees face. Bees do not only make honey, but also ensures the production of two thirds of the food required to keep countless creatures alive through pollination in plants. The decline in bee population irreversibly damages the equilibrium of nature and endangers our food. Therefore, it is extremely important to inform all segments of society about the current situation of bees, to create awareness, and to develop a sustainable agricultural policy regarding beekeeping. With the Live and Let Bee: Training for Ecological Beekeeping funded by the Erasmus+ Program of the European Union, we aim to support the bees, which are one of the most important elements of the ecosystem, to help stop the practices harming the bees and to disseminate the better methods that could be practised by everyone, whether urban or rural. The project started in December 2015 and field trips were organised to apiaries practicing ecological beekeeping in the four partner countries. Existing beekeeping methods were investigated and documented. Each partner conducted a comprehensive communication çalışması on its press and social media network to disseminate ecological beekeeping knowledge. 35 people from four partner countries participated in the training on 4-8 December 2017 in Izmir, Turkey. One of the biggest problems in ecological beekeeping is the difficulty in accessing exact information. Since beekeeping is a big market in terms of chemicals and equipment sales, non-profit, research-based information is very limited. To that end, a comprehensive web site that addresses all the segments of the society was created. 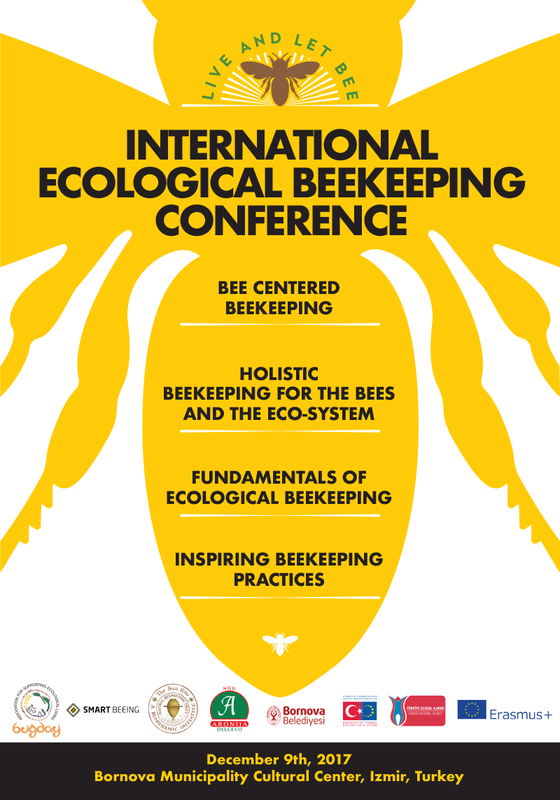 The first conference that focuses on bee-centred beekeeping in Turkey was organised on 9 December 2017 in Izmir.